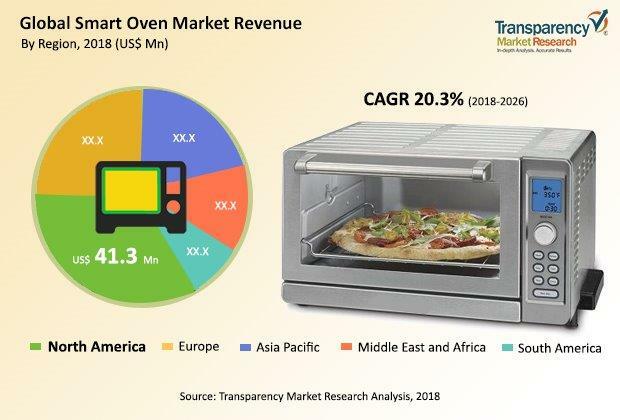 According to a new market report published by Transparency Market Research titled “Smart Oven Market – Global Industry Analysis, Size, Share, Growth, Trends, and Forecast, 2018 – 2026,” the global smart oven market is expected to reach US$ 513.7 Mn by 2026, expanding at a CAGR of 20.3% from 2018 to 2026. North America held the dominant market share in the smart oven market in 2017. A smart oven is an electric appliance which has Wi-Fi or Bluetooth connectivity option to a smartphone. The app allows users to control the appliance remotely or to set automatic functions. The features of smart ovens are the same as conventional ovens; however, they are more flexible in cook top configurations and induction burners which makes cooking faster and also with connectivity options. The market in Europe is expected to have the highest growth rate during the forecast period due to preference of users toward IoT enabled devices and smart home concepts in some countries of the region. The Asia Pacific region is witnessing an increase in demand for smart ovens due to the increasing urbanization and rise in population. More number of households in emerging countries such as China and India are likely to opt for smart ovens due to preference for technologically advanced products. By type, multiple function smart ovens have the highest growth opportunities as consumers prefer to choose these ovens over single function smart ovens by spending a little more. Multiple function smart ovens are used in residential and commercial applications due to multiple features offered. By structure type, built-in smart oven segment holds the largest market share and is expected to continue its dominant market over a period of time as these ovens are preferred by end-users all over the world. By connectivity, Wi-Fi connectivity segment is expected to command the highest CAGR during the forecast period in terms of revenue as end users are looking for convenience and easy to use technologies. Wi-Fi is the most preferred technology in today’s world due to features such as simple connectivity, range of communication etc. By capacity, smart ovens with capacity of 20-25 liters held the highest market share in 2017. The reason for the growth of the smart oven market in this segment is that end-users prefer larger capacity ovens if the same is offered by spending a little more. By application, residential segment in the smart oven market holds the dominant market share and is expected to continue its leading position over the forecast period as there are many residential projects in the pipeline due to urbanization. By distribution channel, offline distribution channel segment in the smart oven market holds the major share as end-users prefer buying kitchen appliances from the showroom or shops. However, the scenario is expected to change in the coming years as more people are expected to buy products from online distribution channels. Furthermore, an omni-channel strategy is expected to have a compounding impact on the growth of wholesalers. It has helped wholesalers to enlarge their customer base. Since it unifies all the channels, it effectively promotes the idea of one brand, one experience to consumers across all touch points. Companies in the smart oven market are focusing on achieving long-term growth through innovations. Some of the major competitors in the market include GE Appliances, Breville Group Limited, Electrolux, Samsung, Candy Hoover Group S.r.l., BSH Home Appliances Corporation, Dacor, Inc., Haier Inc., LG Electronics, Tovala, and Sub-Zero Group, Inc.